Panoramic view from back porch of Clinton Community College. Valcour Island on the right. Photo by Gretel Schueller. Watercolor depicting the American line of battle before the 1776 Battle of Valcour Island. Drawing is titled as follows: New England Armed Vessels in Valcure Bay, Lake Champlain [including Royal Savage, Revenge, Lee, Trumble, Washington, Congress, Philadelphia, New York, Jersey,. 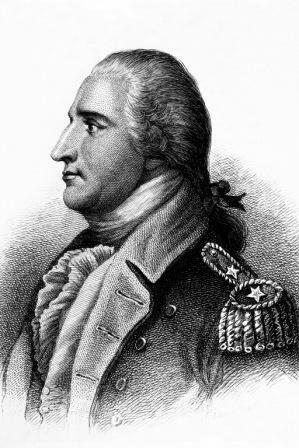 Connecticut, Providence, New haven, Spitfire, Boston, and the Liberty] commanded by Benedict Arnold. Courtesy of National Archives of Canada. 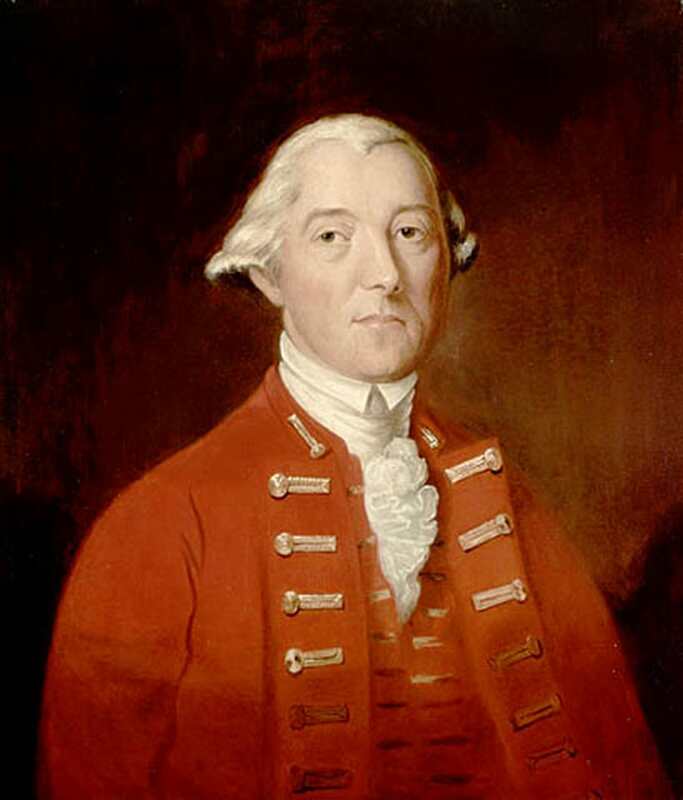 Guy Carleton , governor of British North America circa 1760. Courtesy of the Canadian Military Heritage. In early October 1777, the brisk autumn air swept over Lake Champlain as British ships hoisted their colors and prepared to depart Canada. Nearly 30 ships, followed by thousands of troops in bateaux (essentially fortified rowboats) were assisted by a strong southerly wind as they embarked from St. John on the Richelieu River. Rumors stirred about the size of the Rebel force, as well as their presence on the lake. 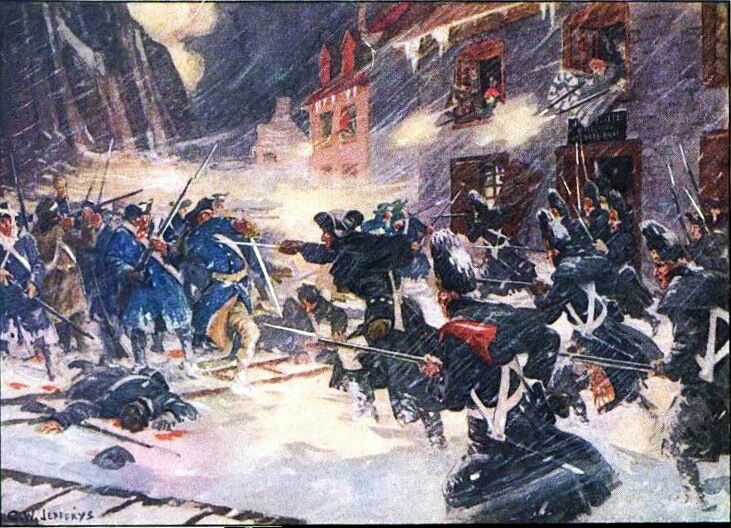 Winter comes on fast in northern New York and Canada, so British General Guy Carleton hoped to defeat the Rebels and gain control of Fort Ticonderoga before ice and snow embraced the wilderness, closing the campaign season. Carleton had a rough previous year. The rebelling American colonists had invaded Canada in the winter of 1776 in an attempt to drive the British from the North American continent. Carleton held the citadel of Quebec City, and with the spring thaw came additional troops from across the ocean that ended the Rebel offensive. Yet several months passed before Carleton was prepared for an offensive of his own to fight the Rebel forces on Lake Champlain. Perhaps most significant for the preparation of the campaign was the construction of a British armada on the lake. These war ships would be necessary to oppose the Rebel fleet, and to lay siege to Fort Ticonderoga, a legendary fort near the south end of Lake Champlain. Naval Lieutenant John Schank coordinated the transport of boats, whole or in pieces, to St. John, by road or over the rapids of the Richelieu River. Only the ship Inflexible was constructed in entirety at St. John. The transport and construction of ships was time-consuming and continued through summer. Outgunned and outnumbered, Arnold selected the shelter of Valcour Island to make a stand. Knowing that the British fleet would sail in the deep waters past the eastern shore of the island, Arnold hid his vessels to the west, which kept them concealed from the British fleet and provided them relief from the cool southerly wind on the lake. If the British armada wished to engage Arnold and his rag-tag fleet, they would need to turn around and tack into the wind, which would prevent the larger ships from joining the fight. Park in the Visitor Parking Lot in front of the main administration/academic building. Take the stairs up to the building lobby and go through to the back porch. We recommend listening to this track–track 1–while sitting on the back porch of Clinton Community College, overlooking the lake. The site of Clinton Community College, known as Bluff Point, is truly a vantage point to history. The building was the site of a 19th-century luxury hotel, during the heyday of railroad travel and hosted a variety of presidents and celebrities. That hotel was destroyed in a fire. The rebuild eventually became the college. The spot offers some of the most wide-sweeping views of Lake Champlain, where on October 11, 1777, booming cannons and gunfire filled the air. You can see Valcour Island to your right. Himalaya – Authentic dishes from the Himalayas in cozy space complete with prayer flags. 78 Margaret St, 4 miles from Clinton Community College. Valcour Brewing Company- In Plattsburgh’s historic Old Stone Barracks, this pub offers craft beer and locally-sourced burgers. 49 Ohio Rd, 4 miles from Clinton Community College. Blue Collar Bistro- Classic farm-to-table comfort food. 82 Margaret St, 3.4 miles from Clinton Community College. Clare and Carl’s- Plattsburgh’s quintessential summer shack for Michigan’s—aka chili dogs—and fries. 4729 NY-9, 6 miles from Clinton Community College. Latitude 44 Bistro- Creative, contemporary fare. 5131 US Ave, 5 miles from Clinton Community College.